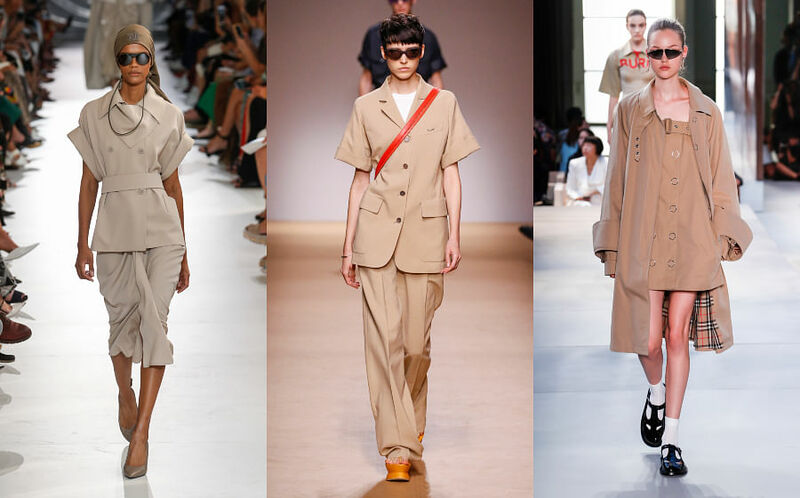 Given the fact that spring tends to favour a more relaxed and softer style of tailoring, it shouldn’t surprise us to see breezy, past-hip-length tunics being paired with sleek trousers for S/S ‘19. But still, it was a silhouette that used to be questionable at best, going against all our instincts in the figure-flattering rule book (oversized + relaxed at the bottom = a shape-swallowing no-no). However, next season’s renditions were immediate game changers for us. Designers, including Anna Sui, Giorgio Armani and Altuzarra, exhibited the style with longline button-up blouses which only had the top few buttons done up, leaving the rest of the garment to open and float down the back. 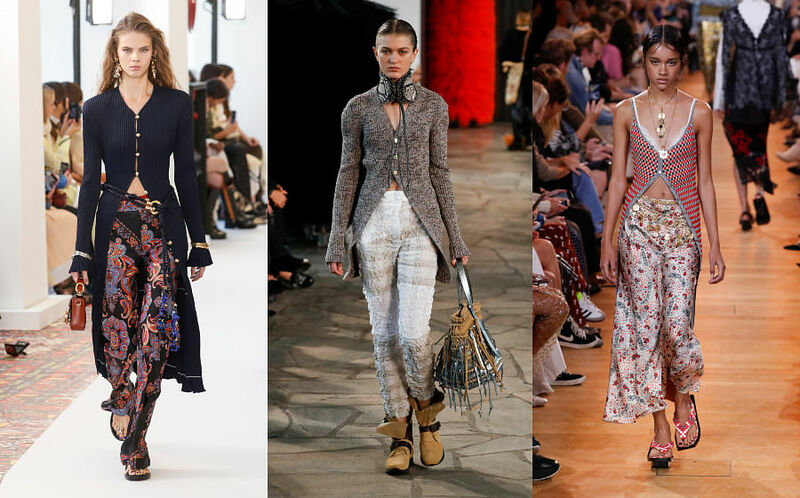 Chloé and Loewe brought a feminine edge to the trend, teaming chic and snug knitted cardigan tops (purposefully unbuttoned the same way) with bohemian-style pants that sit on the hips. The whole halfway-undone technique applied to the tunic (or, what is essentially a shirt dress) gives us a peek at the accentuated waistline and a full view of the trousers, thereby giving way to a sleek look that is anything but frumpy. Eager to get ahead of the trend? 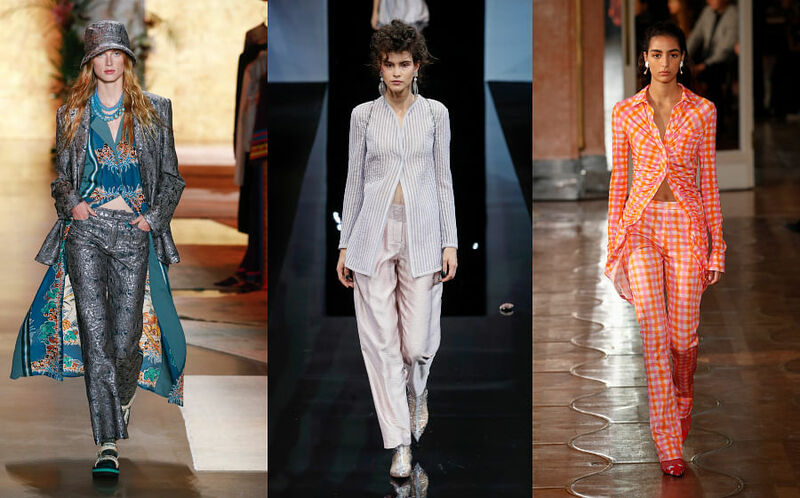 Here are some ways to emulate the runway looks. 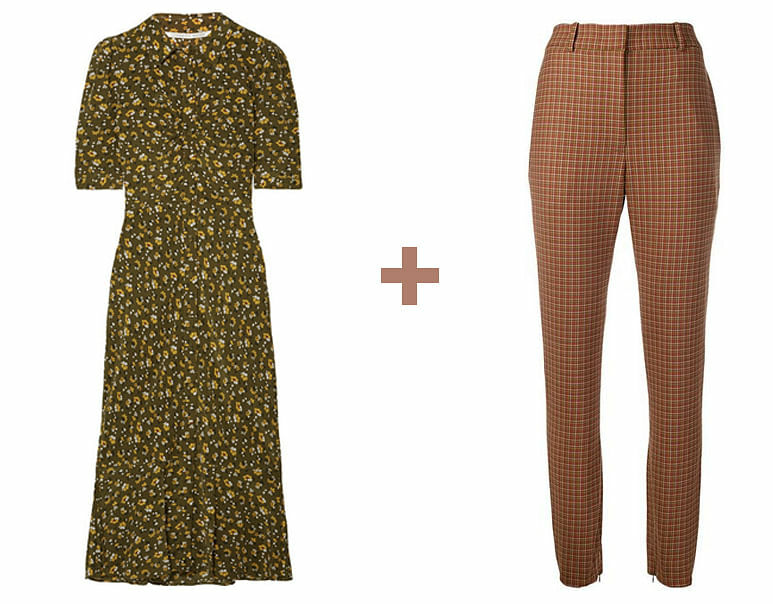 Undo the buttons on this midi dress to midriff-length and style it with a pair of tartan trousers for a vintage feel. Veronica Beard Pike dress, US$596.44 (S$826), from Net-a-Porter. Zimmermann tapered tartan trousers, S$1,377, from Farfetch. 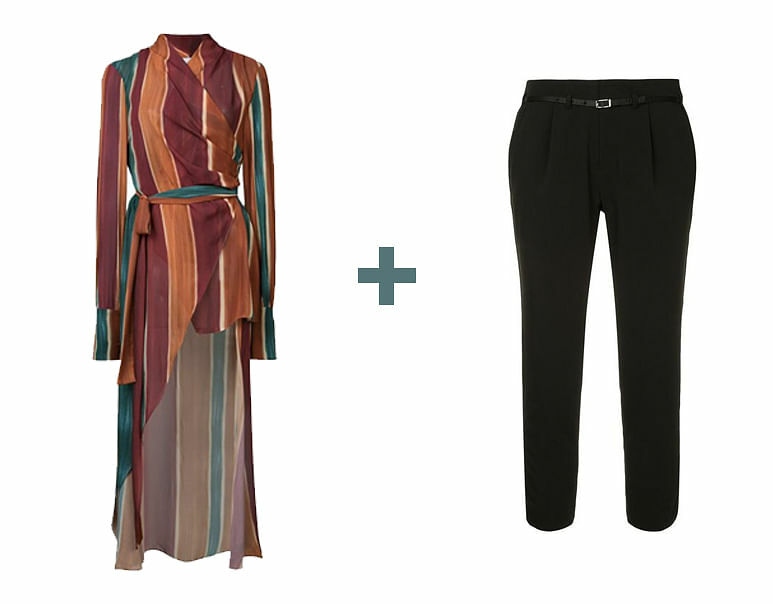 For a sophisticated take on multi-coloured styling, try this asymmetrical blouse and a pair of classic black cigarette trousers. Patbo Rio stripe tunic, S$781, Guild Prime cigarette trousers, S$219, both from Farfetch. 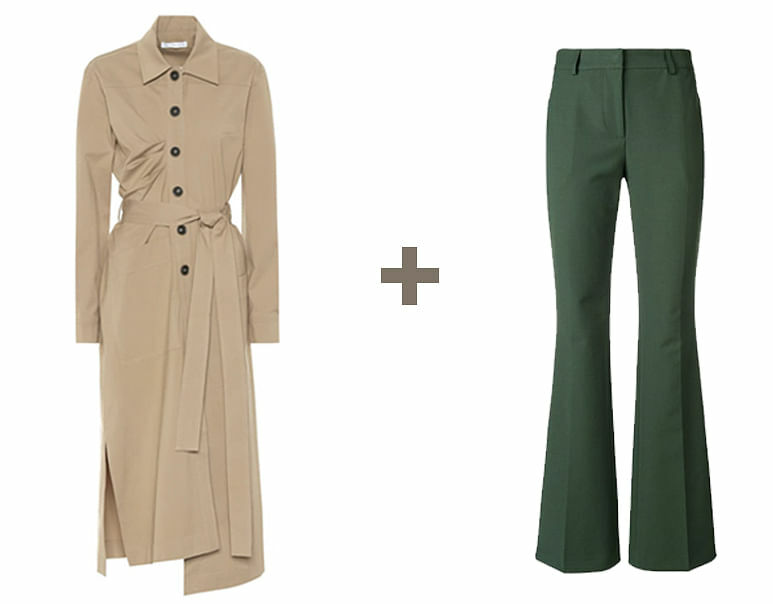 A trench coat-style tunic and a pair of bootcut trousers will look undeniably sensible and chic. Rejina Pyo Madison belted shirt dress, S$869, from Mytheresa. Calvin Klein bootcut trousers, S$273, from Farfetch. For the perfect summer get-up, go for this breathable white top and a pair of cotton-velvet trousers in an earthy colour. Tibi asymmetrical shirt dress, S$505, from Mytheresa. Acne Studios wide-leg cotton-velvet trousers, S$625 from Matchesfashion. 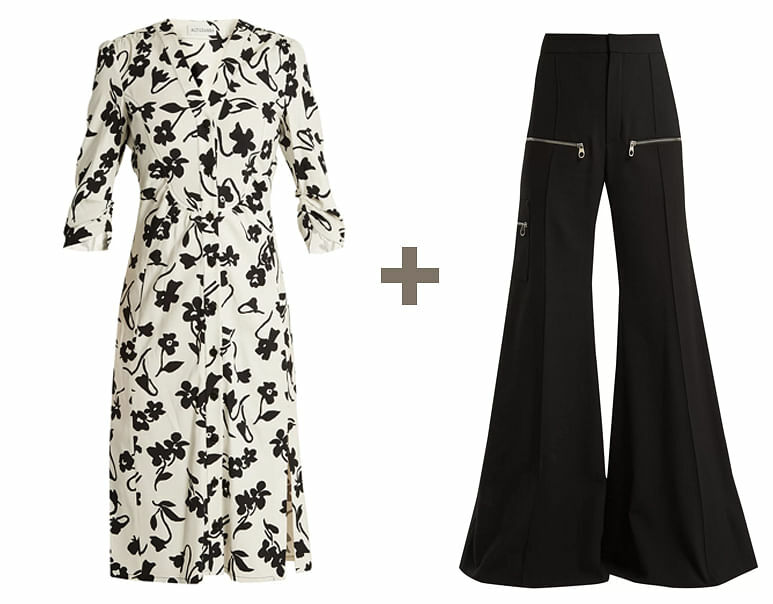 This ensemble, featuring a graphic floral print button-up shirt dress and a pair of flare leg trousers, will help you nail monochromatic dressing to a tee. Altuzarra Aimee floral-print crepe-cady shirtdress, S$850, Chloé wide-leg virgin-wool blend trousers, S$1,520, both from Matchesfashion.